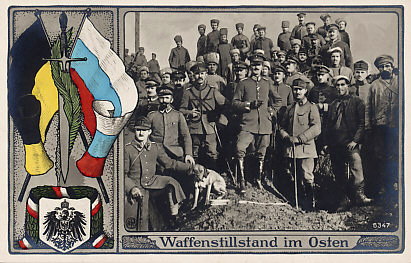 Postcard celebrating the ceasefire on the Eastern Front. The troops are Russian, Austro-Hungarian, and German. The flags are Austrian and Russian; the coat of arms and bunting German. Russia declared a ceasefire on December 15, 1917. The Treaty of Brest-Litovsk, ending Russia's involvement in the war, was signed on March 3, 1918 between Russia and the Central Powers. After the Bolshevik Revolution in November, 1917, the new government agreed an armistice between Russia and the Central Powers in December. The delegations began meeting on December 20, with the Russians expecting the Germans to renounce territories occupied in the course of the war. Recognizing the negotiators needed strong leadership, Vladimir Lenin assigned Leon Trotsky. 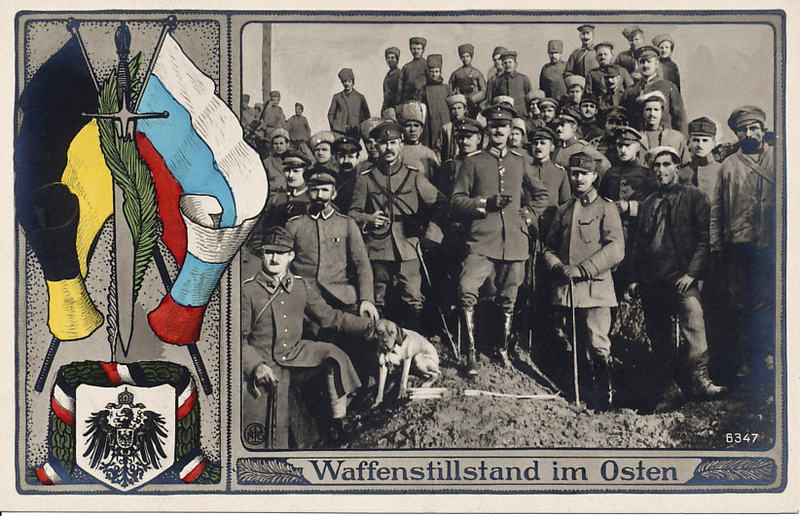 The Germans and Trotsky sparred over territory occupied by the German army, with both calling for self-determination of the peoples of the occupied territories, but the Germans under the current status, the Russians only after an evacuation. On February 10, Trotsky left the conference saying Russia would not sign a peace treaty, but would withdraw from the war. He and Lenin debated whether the Germans would accept this situation or resume the war. On the 16th they received their answer from General Hoffmann, military head of the German delegation. 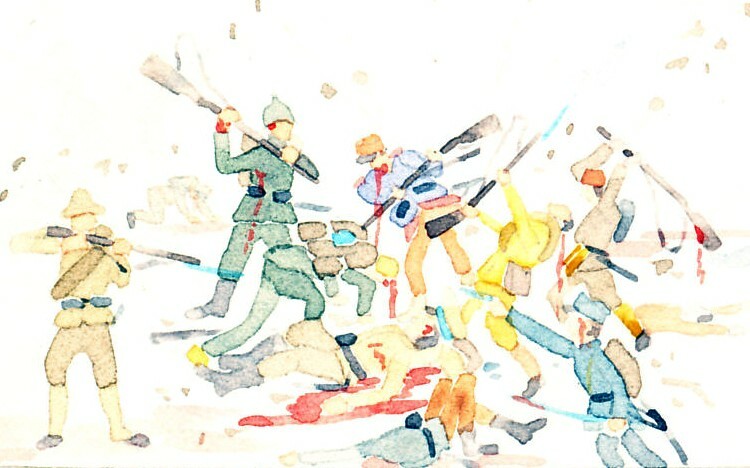 Two days later the Germans resumed the war, violating the terms of the armistice which called for a seven-day notice of termination, and advancing against little to no resistance. On the night of February 23–24, noting that he had no army to stop the German advance, that Germany would otherwise continue its advance, and that future terms would be even harsher, Lenin persuaded the majority of the members of the Petrograd Soviet and the Central Executive Committee of the Congress of Soviets of the need to sign the peace terms demanded by Germany. On March 3, 1918, the Russians, declaring they did so not in agreement but under duress, signed the Treaty of Brest-Litovsk.